As stated in my first post I had been awaiting a shopping trip this fall with my friend visiting from London, where the solitary clause of my shopping cleanse would take effect— I was allowed to buy four items! In my eagerness, I headed to Vancouver a day before my girlfriend's flight was to land. Without shopping as my focus, and accompanied by my best buddy from the city, I got to experience a bunch of firsts. I visited English Bay and North Van. 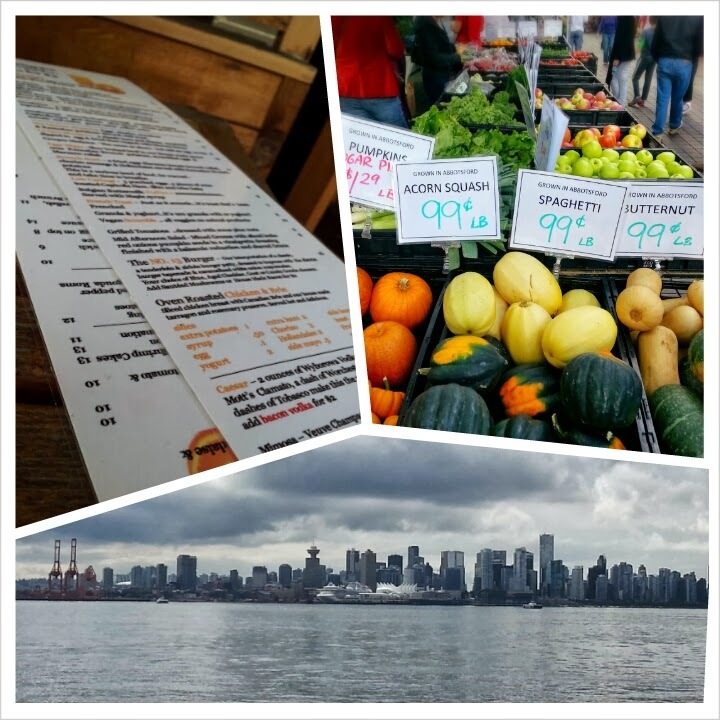 I checked out a farmer's market and had brunch at an amazing little place in Lonsdale. As the day came to an end I rushed to the airport, just in time to see my friend walk through International arrivals. We had been anticipating this visit for months, and our two weeks back together was just beginning. What better way to start it off than with one of our favourite pastimes— shopping! After a good night's rest we started out, and over the hours ahead I experienced much pain of choice. I picked up a lot of things, tried on less, and after some deliberation only committed to the things I loved the most. I activated my super human self control and walked out with four items as promised. What was more fulfilling was the fifteen to twenty that I didn't walk out with. Once back in Kelowna the shopping continued. My girlfriend fell in love with Winners and we spent a few afternoons popping in to check out the new arrivals. My family was kind enough to buy me giftcards for my birthday and I had been hoarding them. After adding a few additional fabulous finds to my fall wardrobe, I started feeling some anxiety about how these experiences might take their toll on my current 30 days clean record. To be honest, what I started with willpower ended up becoming too difficult to handle. Having reached my shopping spree quota and with no limit left on my cards, I re-entered the unbuying realm once again for the remaining 11 months. And I was glad. In hindsight I wouldn't have allowed myself a clause. Or maybe I would have started my challenge after my wonderful September visit with a best friend had come to an end. One thing I know for sure is that I will be requesting no giftcards this Christmas! Unbuyer's Tip #5: In the early stages of overcoming your addiction, keep yourself out of temptation's way.